I’ve continued the work from my last post, and gotten to the point where it’s presentable as a first pass. 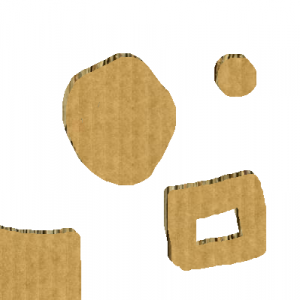 In addition to creating shapes with cardboard, the user can also apply paint and marker marks on top of the cardboard. Paint and marker marks only show up on top of cardboard, and can be erased independently of each other. To try it, click on the image to the left. This is an experiment in using composite modes with canvas rendering to achieve a 3d effect, allowing users to “paint” shapes in cardboard. 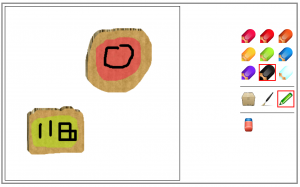 At present, it’s possible to draw shapes with the mouse, and to erase them, all the while maintaining the illusion of 3d cardboard, thanks to both an interior and exterior layer. This is just a start though- I’m hoping to develop this into something much more interesting. To see what I have so far, head here, or just click on the image. A few months ago, I attended SETIcon, which was all-around wonderful. However, I thought that the panel on science and videogames left quite a bit to be desired. Several SETI-themed games were presented, but I felt that they were more about overlaying a SETI theme on unrelated mechanics. Which got me thinking… what would a game that lifted its mechanics (as well as its theme) from SETI look like? I had an idea that I thought could work, and it sat around in my notebook until this past Sunday when I found myself at a laundromat with a laptop and some time to kill. 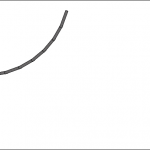 the width (in time) for each sample This alters the way in which the analog signal is translated into the digital. The threshold value can be changed by clicking and dragging the gray box, and is represented by the green horizontal line. The other two values have to be entered in the fields at the bottom of the interface (for now- I plan on making them visually draggable as well). I wrote a small Python script that can be used to translate a given low-resolution image into a sequence of noisy values (like this). The demo only has one image, but it’s one that’s bound to be familiar to SETI enthusiasts and science nerds in general. I was at a really great open studios event in Hunter’s Point, and saw some beautiful paintings that included (amongst other things), undulating plant forms. I thought it would be fun to try to recreate such things but via code, and animated. To see it in action, click on the image. I just participated in my first Ludum Dare competition, with the theme ‘Tiny World’. My game is a bit small, even by Ludum Dare standards, as I’m currently on vacation, so only had the plane ride, plus a bit of time here and there to work on it (not that I’m complaining ). In the game, you take on the role of a planet builder, tasked with creating planets from matter floating through space. 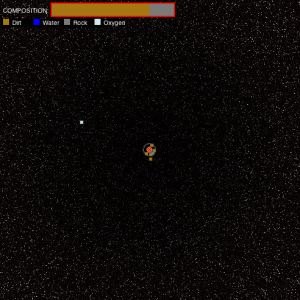 The game lies in rotating the planet so that the matter is evenly distributed, and rejecting matter of the wrong type (each level has different requirements for the planet). To play the game, either click on the image, or go here. I recently bought a conus textile seashell to give to a young relative of mine that loves science. Conus Textile shells are really cool, because the pattern on their surface is almost identical to that created by a simple 1-dimensional cellular automata with 30 as the ruleset. 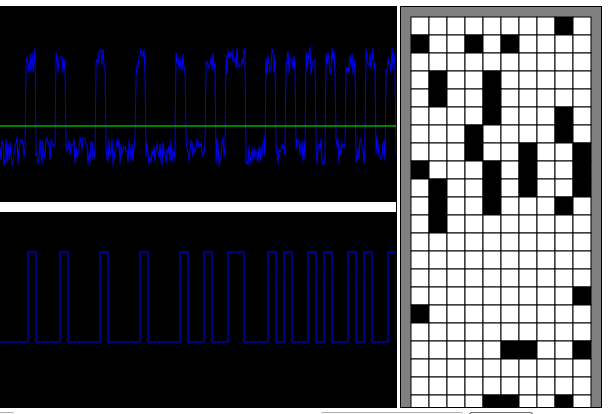 But instead of just giving her the shell, I wanted to make her earn the gift through a game-like exploration of cellular automata, with the shell being the big reveal after she’s completed it. This is a first pass at such a game. 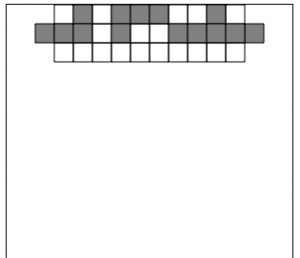 At the start, a single line with random state is presented to the player, along with a blank line. Mousing over any of the cells will highlight the three previous cells that determine the state of the mouse-over cell, and clicking on the cell will toggle its state. Once all of the cells in the new line are correct, a new line is added to the display. Over time, the distinctive pattern found with rule30, and on conus textile shells, will emerge. Another day, another HTML5 experiment. This time around, I created a class to handle loading and drawing images. The image class also maintains a list of children, allowing for hierarchical animation. I just finished a second small html5 example. In this one, I create randomized terrain and place a soccer ball in the middle of the resulting field. The arrow keys will accelerate the ball left and right. The ball both follows the terrain and rotates as it moves. Go here to see it in action. Just spent the evening watching Dexter and playing around with the canvas tag. 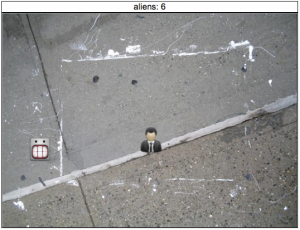 I made a small game-like experiment that lets players control a man in black to capture aliens. Not terribly polished, but it’s a decent example of gameplay for a couple hours of messing around. Click here to see the result in action.